We are a leading Exporter of magnetic separators and aerobic gravity separator from Sonipat, India. 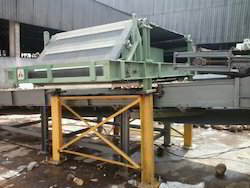 MAGNETIC SAPARATOR: The static magnetic separator can remove the ferrous content from the material to ensure that there is no damage to the other equipment. AEROBIC GRAVITY Separator : This is the unique equipment which segregates material on the basis of difference of weight. All pebbles and density materials will be separated and will be sent to landfill. It separates light and heavy material.